Welcome to What's In Your Purse? (Click Here) Take part in the Vote Caster ! (Click Here) Photo Gallery ! June 4 - September 17, 2000. The purse is a common object, carried over the arms and on the shoulders of millions of women of various ages and cultures around the world. At the same time, there is a sense of mystique attached to each individual purse - aside from carrying identification, keys and money, what's in that purse? What are people carrying in their purses and what do those contents reveal about us and about our times? If you have a purse or an interesting object from your purse that you would like to donate, please go to the guestbook and let us know. If you leave your e-mail address, we can contact you. Thank-you ! 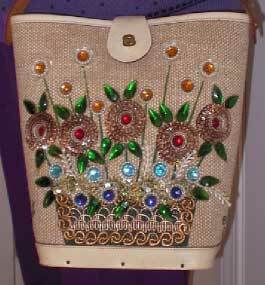 Please be sure to take part our on-line VOTE CASTER about purse information. Or enter your purse story here. Join the What's In your Purse ? Mailing List and get updated on events ! Copyright 2000 - Sponsored by A & A Contract Customs Brokers Ltd.